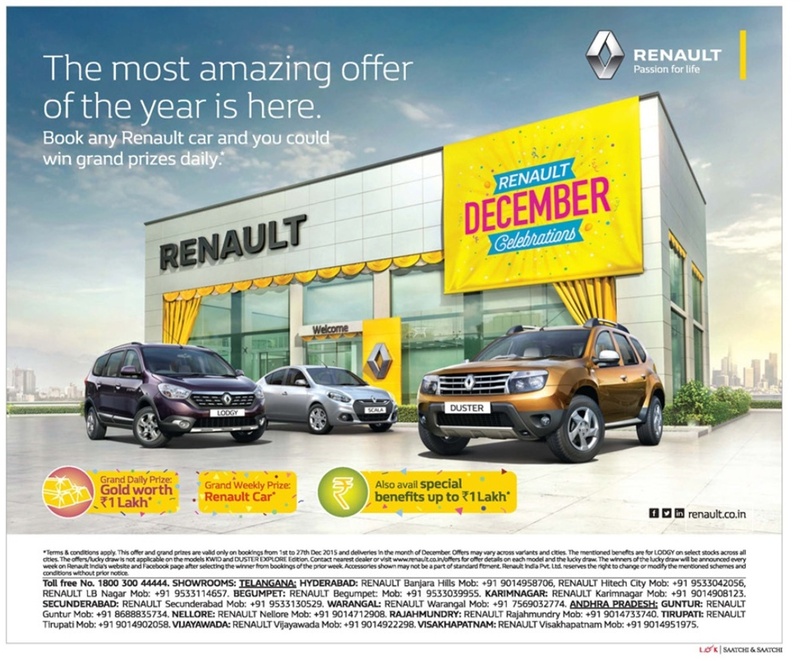 Renault December celebration are here for you with the most amazing offer of the year. Book any renault car and you could win grand prizes daily.Grand daily prize gold worth rs 1 lac. Grand weekly prize: renault car. Also avail special benefits up to rs 1 lac. Offer and grand prizes are valid only on bookings from 1st to 27th December 2015 and deliveries in the month of December. The mentioned benefits are for lodgy on select stocks across all cities. The offers/lucky draw is not applicable on the models kwid/duster explore edition. 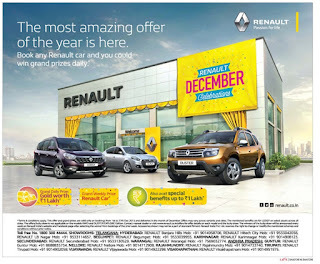 Contact nearest dealer or visit www.Renault.Co.In/offers. For more information, please call toll free no. 1800 300 44444. Showrooms in hyderaeiad: renault banlara hills mob: +91 9014958706, renault hitech city mob: +91 9533042056, renault lb nagar mob: +91 9533114657. Begumpet: renault bequmpet mob: +91 9533039955. Karimnagar: renault karimnagar mob: +91 9014908123. Secunderabad: renault secunderabad mob: +91 9533130529. Warangal• renault warangal mob: .91 7569032774. Tatipligiagaaath guntur renault guntur mob: +91 8688835734. Nellore: renault nellore mob: +91 9014712908. Rajahmundry: renault rajahmundry mob: +91 9014733740. Tirupati renault tirupathi mob: +919014902058. Viayawada: renault vljayawada mob: +91 9014922298. Visakhapatnam: renault visakhapatnam mob: +919014951975.